No giving sporting, herding, etc. Mo reading from a book to look up, no cheating. They are a herding breed that comes in 4 colors, merle, tri and solid they have no tail and are an American breed. hummm.... is it the English Toy Spaniel? Is it a Eurasion(sp?) Dog? 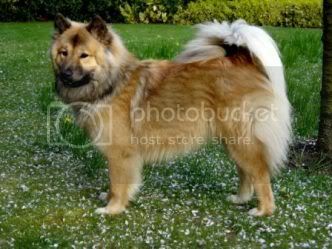 yes it's an Eurasian dog. well done .